May. 11, 2013 9:00 a.m. Volunteers from Wizard Lake Stewardship attaching fish to the fence. A “Stream of Dreams”… The onset of spring’s warm weather melts the winter’s snow, creating streams of water draining from the fields and ditches into nearby creeks, rivers, ponds and lakes. Water, a life necessity, flows within each watershed, but have you ever given any thought as to what else might be draining into our waterways and the affects that may occur on fish and wildlife habitat? Students at New Humble Centre School, in Leduc County, near Wizard Lake were recently given an opportunity to learn more about watersheds, and the importance of protecting water and fish habitat in our streams, rivers and lakes. During Education Week, the school hosted a program called “Stream of Dreams” that included an education science workshop followed by art instruction and the painting of wooden “dream fish”. “The fish to paint that will form a stream on the school’s fence are to remind us to look after the water,” explained Val Schumacher, an instructor with the Streams of Dreams Mural Society, a non-profit registered charity whose mandate is to educate youth about watersheds. As a result of a devastating toxic spill in 1998 in Byrne Creek, B.C., the “Stream of Dreams” was formed in Burnaby, B.C. in 2003. The Society was formed to provide environmental education through a community art program, for students to learn the importance of the connection of water to fish habitats. With teams trained in Ontario and Alberta now as well, several schools and communities in three provinces and one U.S. state have participated in the program. This rather unusual program shows students and communities the power of a dream. To dream a future with healthy streams, the dream fish symbolize hope for our rivers, streams, lakes and oceans. “Think about what you could do to look after the water in your community,” Schumacher told the students, as they discussed such things as responsible use of fertilizers, using biodegradable soaps, proper disposal of litter and recyclable containers, and never flushing unused, outdated medicines. She explained the water cycle, and showed on a map of Canada the flow patterns for water to eventually reach the oceans. Locally, she pointed out the Wizard Lake Watershed and how a stream from the lake runs into Conjuring Creek which then flows into the North Saskatchewan River, emphasizing the importance of keeping water clean, not only for the fish, but also for ourselves, as it is eventually treated and used by cities and towns in the area. Schumacher has a background in zoology and has been with the Society for four years. “It’s a fun program to be involved in; it’s creative,” she said, adding that they use eco-friendly paint. The enthusiasm in her presentations, and that of Shawna Edworthy who was instructing the painting workshops, displayed their enjoyment in this program. In the painting workshop, when the young students were asked what they learned, one youngster, Dylan, said “don’t throw bad stuff into the drains or the fish might get poisoned.” Watching and hearing the children’s and teachers’ reactions and interest in the day’s activity and seeing some true artistic talent shine through certainly gave this eco-education program credibility. When Cathy Holman, a member of the Wizard Lake Watershed and Lake Stewardship Association (WLWLSA), first heard of the program, she was enthused about it and excited to present the idea to a school close to Wizard Lake. 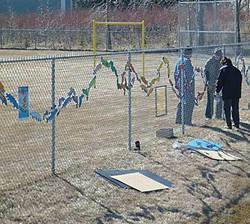 “With the mandate of the Streams of Dreams Mural Society to educate youth about watersheds and create a fish mural to remind us that we are stewards of our environment and the need for healthy watersheds, we applied for a grant to assist with the program costs and asked New Humble Centre School if they would like to participate,” she said. When Principal Jennifer O’Brien was approached by Cathy to determine the school’s interest in Stream of Dreams, she was impressed with it. “We were very receptive to the school participating, and to incorporate it as a community project and part of Education Week,” she said, “as we celebrate community – that is what our school is about”. With the participation of students, teachers, parents and others from the community, as well as members of the Watershed Association, the Stream of Dreams brings the school and the community together. Creating 200 wooden fish and installing them on a wire fence is not an easy task. A number of volunteers from the WLWLSA and the community pitched in to bring this amazing project to life. Funding and/or support was provided by the Land Stewardship Centre, Leduc County, Calmar Secondary School CTS, the WLWLSA, New Humble Centre School and other community participants. It took over 300 hours in time and equipment to cut, sand and prime the fish, for which Cathy expressed her appreciation to Blake Bartlett, Allan Coles, Albert Faulkner, Walter Kolodychuk and LeVerne Ellsworth, as well as Calmar CTS students. Some WLWLSA members, parents and teachers assisted at the painting workshops, and the following day a group from the WLWLSA spent the morning installing the creatively painted fish on the school fence. This unique project was indeed a successful, community effort, with a message to take care of, protect and honour water as all drains lead to fish habitat. For more information, to donate or to join the growing Stream of Dreams watershed and beautify your neighborhood, contact the Stream of Dreams Mural Society, at www.streamofdreams.org For more information on the WLWLSA email stewardship@wizardlake.ca.